Sometimes you’ll need your HTML5 game code to make decisions or choices. 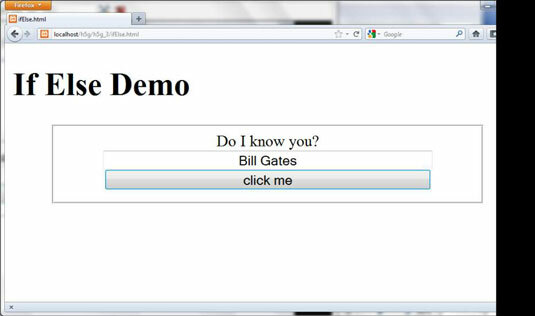 For example, if somebody famous typed their name in your website, you might want to create a custom greeting for them. As you can see, the program looks at the input in the text box and changes behavior based on the value of the text field. Set up the web page as usual. The HTML code has elements called lblOutput and txtInput. It also has a button that calls checkName() when it’s clicked. Create variables for important page elements. You’re getting data from txtInput and changing the HTML code in lblOutput, so create variables for these two elements. Use the txtInput.value trick to get the value of the input element called txtInput and place it in the variable userName. The key to this program is a special element called a condition — an expression that can be evaluated as true or false. Conditions are often (as in this case) comparisons. Note that the double equals sign (==) is used to represent equality. In this example, this is asking whether the userName variable equals the value “Tim Berners-Lee”. Place the condition in an if structure. The if statement is one of a number of programming constructs that use conditions. It contains the keyword if followed by a condition (in parentheses). If the condition is true, all of the code in the following set of braces is executed. Write code to execute if the condition is true. Create a set of squiggly braces after the condition. Any code inside these braces executes if the condition is true. Be sure to indent your code and use the right squiggle brace (}) to end the block of code. 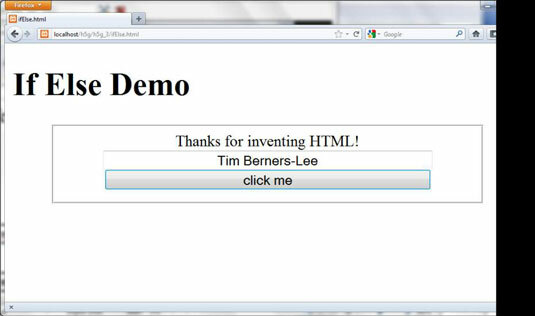 In this example, there is a special greeting to Tim Berners-Lee. You can build an if statement with a single code block, but often you want the code to do something else if the condition is false. Use the else construct to indicate you will have a second code block that will execute only if the condition is false. Write the code to happen when the condition is false. The code block following the else clause executes only if the condition is false. In this particular example, there is a greeting for everyone except Tim Berners-Lee. lblOutput.innerHTML = "Thanks for inventing HTML"
a == b a is equal to b.
a < b a is less than b.
a <= b a is less than or equal to b.
a >= b a is greater than or equal to b.